Notes: Complimentary ARC received via Amazon Vine in exchange for an honest review. What a different story. 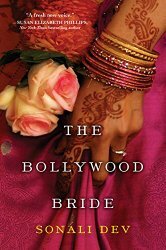 It's been a while since I was treated to a romance that had a solid dose of Bollywood spice and that's what I wound up enjoying most about THE BOLLYWOOD BRIDE. Ria is one of those onion characters, you just keep peeling layers and seeing more of whom she is. But I honestly never warmed to Vikram and their romance never felt like it was the central plot. While there's a touch of gothic romance underscoring part of Ria's past in good ways I found myself feeling as if Dev was trying to cram too many ideas into this book. Having not read her first book I'm not sure if this is just her style or an issue with this one only. If you're in the mood for something romantic that has a lot going for it beyond the happily ever after check this one out.